Absolutely gorgeous scarf has everything you could ask for! Center of scarf features two flying angels both holding a single wreath on either side, all within a circular floral design. The outer circle holds an alternating cross representing life, open bible representing the Word of God, and a flying dove holding a small branch, representing peace. The words I love (heart) Jesus are displayed all along the outer edge. 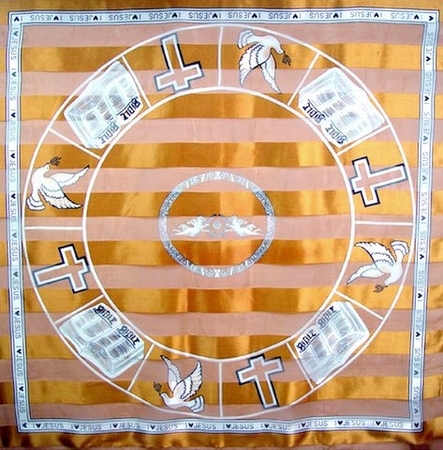 100% polyester scarf alternates sheer with satin finish stripes measuring 2" with the entire scarf measuring 40" square.